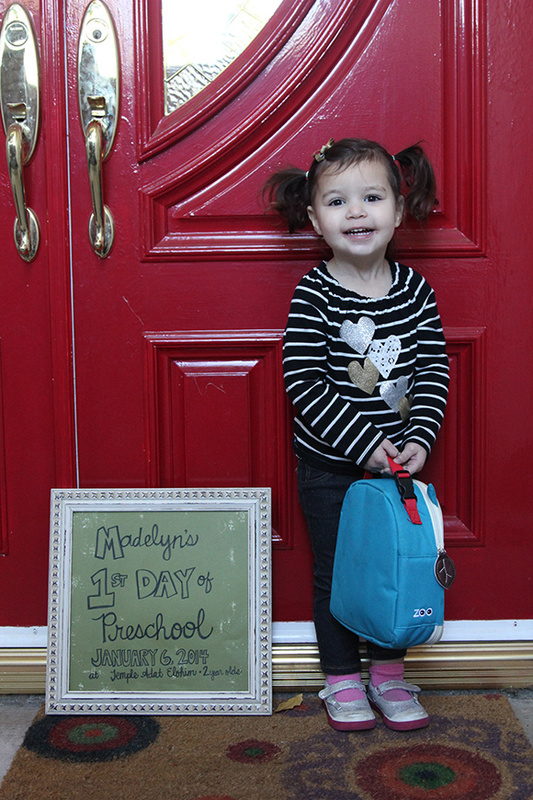 Twas the night before Madelyn’s first day of preschool, and all through the house, a mommy was stirring — BECAUSE SHE’S A NEUROTIC WOODY ALLEN MOTHER WHO NEEDED TO BE SURE THAT HER DAUGHTER’S FIRST DAY OF PRESCHOOL EVER WAS THE MOST MEMORABLE EXPERIENCE OF HER LIIIIIIIIIFE. Mama’s got issues. That’s OK. It means I care too much. A lot. The night before school, Bryan and I talked up the whole shebang. We actually did make lunch together and it was fun! Normally I dread making lunches, especially my own for when I go to work AT school, but Madelyn and I teamed up. She held the bag and counted the carrot sticks as I dropped them in. And I gave her the choice of strawberry jelly or grape jelly on her sandwich. It was such a team effort. 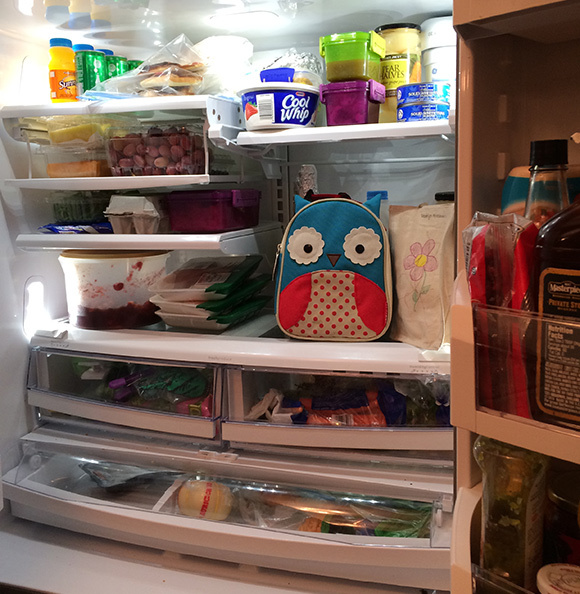 And then I lost my marbles when I put her cute little owl lunch bag in the fridge. Because preschool! So hard to believe that we have crossed the line into this little category. For months, BabyCenter has been sending me emails about Madelyn’s development because, you know, the Internet gods know everything, and the same folks who updated me on the produce in my belly, and the infant in my arms, and the toddler on my… everything… the same folks have been sending me emails subjected “Your Preschooler” since August. Eh eh — not so fast, Internet gods! My Preschooler was not in preschool because I felt she needed a little more time at home (i.e., we bought a house and we were po’!) but now those emails are like Shakira’s hips: they don’t lie! 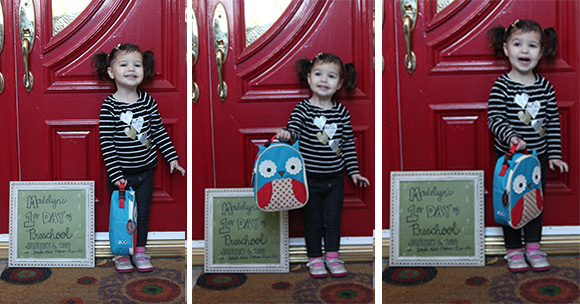 My little poppyseed has become a preschooler! I was so excited to watch her grow, make new friends (for all of us! ), and, well, for me to get a manicure at 10 a.m. But yes, the whole thing was bittersweet because there’s something so unbabyish about taking your toddler to preschool. 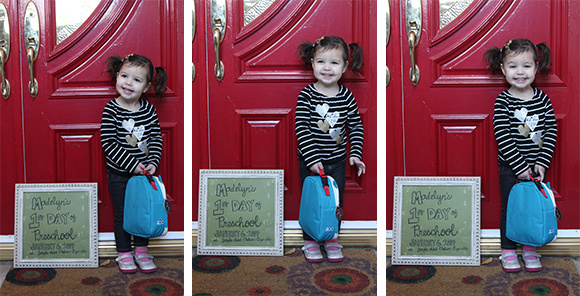 Madelyn is almost closer to kindergarten than she is to newbornhood. Crazy, that tick-tock of time. I got myself up, managed to put on makeup and a bra — both things I usually don’t do before 10 — and then woke up Sleeping Beauty who was not impressed with the whole exercise. But I reminded her it was Preschool Day and she smiled super big. We got dressed, did our hair, and Madelyn was in a great mood. She had breakfast and we went over all the wonderful things she could expect. Just before we left, we took The Picture in front of the door. Isn’t that a rite of a passage in and of itself? I’ve seen all my friends do this for years, and while I was tempted to do the same for Princeton before his first night of Obedience School, I skipped it and waited to be able to do this with my own (human) child. Today was the day! Thankfully, she cooperated for the camera. 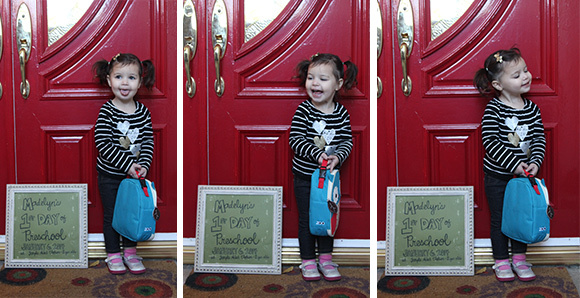 Lately, she’s anti-paparazzi and has mastered giving “the hand.” She was in such a good mood, she posed and giggled and showed off her lunch box! Her arms gripped her Daddy’s leg like a hippie’s on a tree, and she would. not. let. go. OK, OK, so, she’s a little bit of a leg hugger and is usually slow to warm when entering a room anyway. No big whoop. We’ll ignore this behavior and get to know the room and the teachers and all that. Well, she gave the side eye to anyone who even so much as breathed the same oxygen as her in the room, and didn’t show any signs of unlatching. 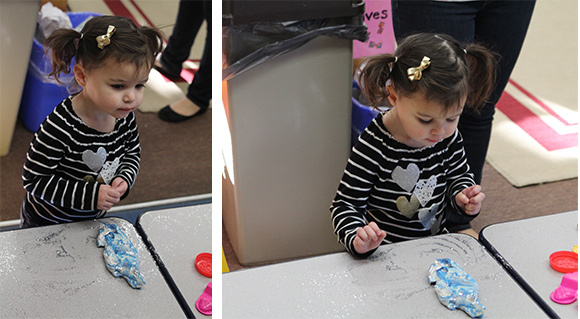 Finally, one of the teachers got her to at least sit in a chair and she looked at the play dough while the other kids made museum-quality works of art out of it, but hey, at least she looked at it. We had done all of our admin duties and made our way over to her for the kiss-off. A quick “goodbye and love you,” sealed with a kiss, and a promise that I’d be back in a little bit (three hours) seemed to do the trick. No tears. No hysterics. It was a perfect morning after all. 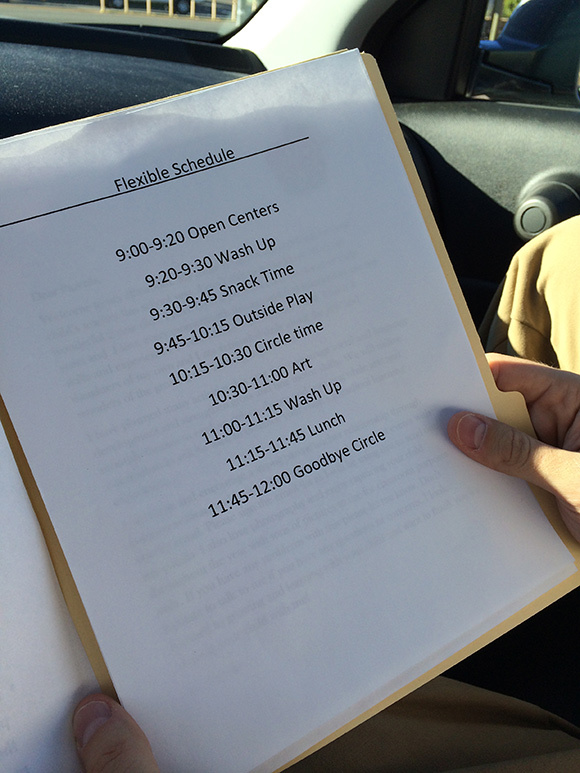 We drove off campus, Bryan and I looked at the “Schedule” the teachers gave us detailing a typical day of Madelyn’s class and we wished we were two, and then we went our separate ways for the day. I felt 28.7 pounds lighter when I realized I had a whole 2.5 hours ahead of me to do whatever I wanted and efficiently. Bryan’s going to propose this new schedule to his boss at work. Until 10:45 when I got a phone call that I should return to school. School gets out at noon. Apparently, Madelyn had a bit of a roller coaster morning after we’d left. Thankfully, it wasn’t the tantrum kind, but she was sad and definitely asking for her mommy over and over again. She saw her beloved Mommy & Me teacher on the playground and had a hard time accepting the fact that she flew that coop, and was in a new nest with new wonderful teachers and new sweet friends. 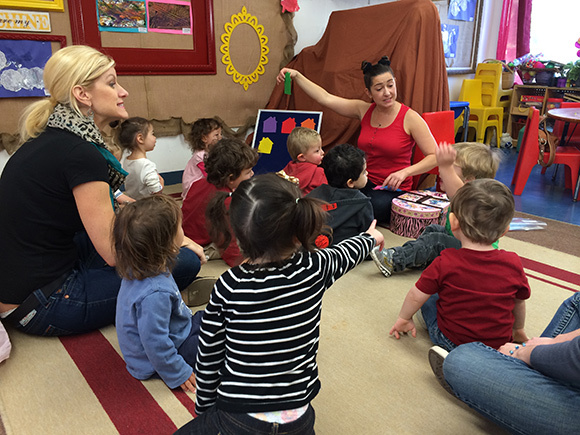 That adjustment must be hard for toddlers — to be at the same school, but in a different class with a different format and different faces — so I totally get it. I came back in the classroom to find the kiddies eating lunch — and so well, I might add! — and Madelyn was a happy little girl. She was told that I was coming back and she perked back up. 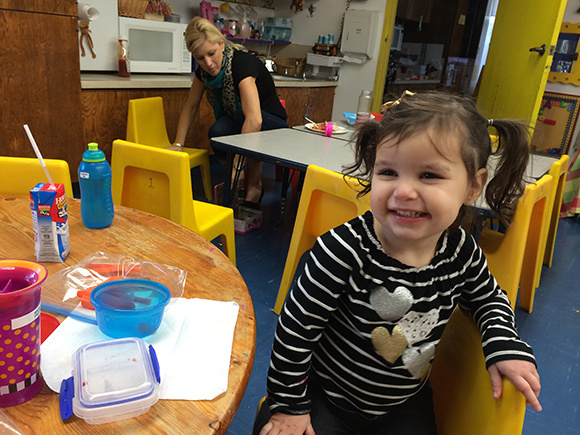 We ate lunch together and I was so impressed with her independence and the routines in the classroom which, as I could see, the seasoned teachers had well oiled. We finished up the day with some circle time and some songs. I made sure she felt comfortable having me there, but didn’t want to participate too much and convey a Mommy & Me-type setting for her, so I gave her short cues based on her teachers’ directions to the whole class, and she settled in really nicely. Madelyn participates at circle time at the end of the day! The end of the day came quickly, and Madelyn was in a great mood. Despite the rocky transition in the first half, I’d say the day as a whole was successful. I’m so proud of my little preschooler and know we have many years of memories to make together in our preschool community. And she sang “Shalom Haverim” so beautifully, that Babs better be shakin’ in her boots. I so look forward to your updates! What a little trooper…MOMMY! haha. New friends, new adventures, growing up. It’s all part of the plan for kiddies and a really hard transition for moms! Book those mornings! Lots of mani/pedi’s, lunches, movies (if they aren’t too long!) 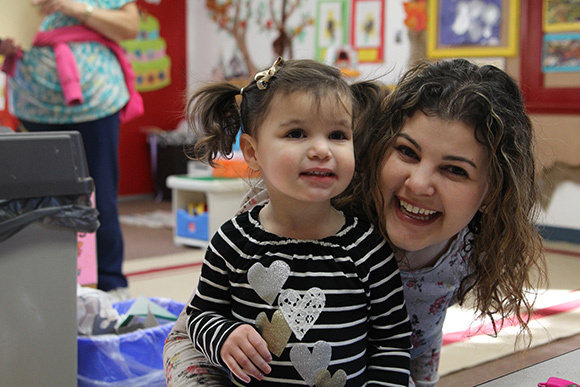 Enjoy your mommy time, while Madelyn grows to love school! Dear Sweet Madelyn! I’m so happy that you had a busy & fun day in your new pre-school class. I love your schedule of activities & that you will have very clean hands. 😉 It will be fun/funny to look back on this big event/milestone & see that you are still friends or even went all through your school years with some of your new classmates. Starting with today, I can’t wait to be able to go to lots of your school events! !